Battery Asking » Cleaning » Best Backpack Vacuum Cleaners (Reviews 2019) – Why is it essential to use a backpack vacuum? Backpack vacuum cleaners have started finding a place in the market. Once known for commercial use, backpack vacuums have now entered the residential for domestic use. This types of vacuum cleaners have an excellent filtration system with most having four-level plus HEPA which improve air quality in homes by cleaning 99.97% pathogens up to 0.3 microns. Since most of the backpack vacuums are pricey, there is a need to research carefully to get that particular one which would be adequate for your cleaning services. But, how will you know which is the best backpack vacuum cleaner? Cut the gruesome searching task and have a look at the six of the best backpack vacuum cleaners in the market which we have carefully and intensely identified for your easy pick. Follow the conversation to read more about these units which will help you make a sound choice of what you need. Q: Why is it essential to use a backpack vacuum? Q: Can backpack vacuum cleaner suction pet hair? Q: Why should I choose a backpack vacuum cleaner over an upright one? Which backpack vacuum cleaner is your best pick? When you think about Hoover CH30000, visualize yourself carrying the light-weight vacuum weighing 8.3 pounds. It is a lightweight canister vacuum which is easy to handle while cleaning. You can either use it for commercial or residential cleaning since it is constructed as a commercial grade. It is suitable for large and small areas since it has a 33-foot long power cable. You will, therefore, use it to clean a large area without the need of plugging to another outlet unless that space goes beyond this cable. You can clean hospitals, school classes or halls, restaurants, offices, and homes to ensure a clean and healthy surrounding thanks to its a wide cleaning path. Hoover PortalPower has a reusable cloth bag which you can reuse by washing it after disposing of the dirty content to use again and again. You can also choose to use this cloth bag to collect sharp objects especially when cleaning hospitals. Also, it has an option of using a paper bag for easy cleaning especially for collecting dust. It has a built-in blower which many other backpacks or even regular vacuums lack for debris dissemination and quick cleaning. It makes it a versatile vacuum cleaner to clean your upholstery and even the interior of your car including the seats. 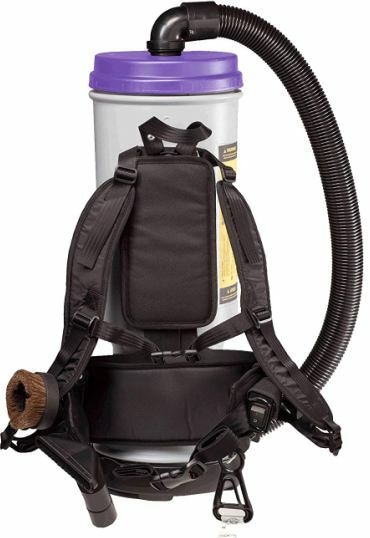 This backpack vacuum also features a stretchable hose which extends to reach hard-to-reach areas such as the ceilings, draperies, and under furniture. It has other accessories for your detailed cleaning. It is a lightweight backpack vacuum cleaner weighing 8.3 lbs, a good weight you can carry for an extended time with less fatigue. One downside with the vacuum is that the shoulder strap lacks padding which can strain your shoulders when you have an extensive cleaning. For those who can’t carry heavy weight, then Atrix is the right backpack vacuum cleaner of your choice. It is a lightweight of 10.3 lbs with dimensions of 12 x 9 x 20 inches which is the right size that can’t bump into things as you move along when vacuum cleaning. The weight does not compromise the robustness of this vacuum since its 1400 watt / 12 amp of 120 volts which makes it a powerful vacuum cleaner. It has a high CFM output (cubic foot per minute) of 160 CFM making it highly viable for large cleaning areas. It comes with different attachments for multi-tasking. Atrix Backpack Vacuum has an ergonomic backpack that is comfortable to carry around thanks to its wide and padded shoulder straps. This vacuum cleaner uses a HEPA filter to capture all dust adequately and prevents air pollution by allergens leaving it clean and breathable. You can use this powerful suction vacuum for both of your residential and commercial cleanings. It is also a multi-purpose that you can use for pest control in hospitals, hotels, school, and in warehouses. You can convert it to work as both a vacuum and a blower by adding a set of 3 blower nozzles to increase its quality. For a high-performance backpack vacuum cleaner, a 30-foot power cable is ‘too short’ for it. You can easily convert the backpack to suit proper side, whether left-handed or right-handed. You can also store the vacuum’s accessories on the belt for easy accessibility when working. The handle might be too weak for the backpack. Avoid using it and instead, use the shoulder straps even when lifting it. ProTeam CoachVac which is a U.S product has a motor capacity of 1108 watts/9.9 amp and 120V with dimensions of 14 x 33 x 14 inches. It weighs 11 pounds that is easy to carry. The vacuum cleaner does justice to its name by its pro vacuum cleaning. This backpack powerhouse vacuum cleaner is made to tackle heavy-duty cleaning while sitting comfortably on your back. It operates with a 50-foot power cable to cover large areas without the interruptions of unplugging and plugging when busy working. Most professional cleaners prefer using CoachVac for its high performance. The commercial high performer vacuum comes packed with all necessary cleaning tool kit for detailed cleaning. The package includes a 2-piece vacuum wand that can vacuum a larger square area such as meeting halls. It is useful in cleaning carpets and rugs, and that is why it has been certified with a seal of approval No. 81321 by Carpet and Rug Institute (CRI). The vacuum emits warm air from the bottom making you feel hot and sweaty. But, it is one of the best backpack vacuums for both commercial and residential use. If you are looking for a multipurpose backpack vacuum to clean all kinds of floors, then Sanitaire is the kind you need. At 11.5 lbs it is a light-weight vacuum and yet powerful with an ergonomic harness that will make using it a breeze. You can adjust the harness to fit your size to carry it with ease. The vacuum is manufactured by one of the largest and popular appliance makers, Electrolux and thus strictly meets the required set standards and the customer’s requirements as well. Sanitaire also meets the CRI requirements, and thus CRI has honored it with CRI Seal of Approval. It shows then that Sanitaire can satisfactorily carry any cleaning job that requires high standards of filtration. It means then that it is a vacuum which is superior to have been tested and passed the most stringent test in carpet vacuum cleaning and retaining its appearance. Sanitaire filters air and removes 99.97% of microorganisms at 0.3 microns using a HEPA filter to leave you with quality air free of pathogens. It comes with carpet and hard floor cleaning tools with curved aluminum wands to clean those hard to reach areas. It has a small collecting bag which requires you to empty now and then. But, that can’t beat other high qualities of this unbeatable backpack vacuum cleaner. If you are looking for a backpack vacuum cleaner that can endure aggressive cleaning and still stand strong, then your choice would be Powr-Flite Backpack vacuum. It weighs 12 lbs which become as nothing on your shoulders and thanks to the ergonomic harness from Deuter that distributes most weight to the hips. The harness can also be adjusted to fit comfortably on the back of the operator. The backpack vacuum is served by a high-quality 50-foot power cord from Powr-Flite Equipment and Supplies which it has customized for this particular vacuum cleaner. It is a 6-quart vacuum cleaner with 120 CFM (cubic foot per minute) and operates with a 4-stage filtration system including a HEPA filter to lift the indoor air quality. Powr-Flite is a quieter vacuum when on operation with 70 Decibel effects which is the lowest limit of ambient sound allowed in the urban setting. It means, therefore, you are at liberty to operate it any time of the day without the fear of noise pollution. The vacuum cleaner provides high-quality cleaning due to its powerful suction. It comes with different tools to undertake numerous cleanings. You can fit them on the waist belt for convenience sake. If only the lengthy power cord had a reel to reel in and out as you need it, your work could be much better and well organized. But, if this won’t disturb you, don’t hesitate to go for Powr-Flite backpack vacuum cleaner. The Super Coach Pro is a sturdy backpack vacuum that has been tried and proven to last its five-year motor warranty while undertaking vigorous restaurant cleaning. It has four filtration-level systems which protect its motor against dirt and grease. The filtration systems which include HEPA filtration is responsible for removing 99.97% of microorganisms to reduce up to 0.3 microns for air quality. The vacuum has a triangle shape which fits comfortably on the back of the user and thus reduces accidental bumping and breaking of furniture or other damages. The 10-quart backpack vacuum would feel lighter even though it weighs 10 lbs with a slimmer and a shorter profile. The patented backpack is an ergonomic one with an articulated harness that fits and moves with the extent of the body motions. That way, it becomes flexible enough to reduce body fatigue for extended use. Among the various accessories are 1½-inch antistatic and dissipative vacuum hose and a 50-foot power cable long enough to make you move and clean far and wide areas. However, the backpack vacuum is not well designed to clean carpets or rugs. Even though it comes with a brush for carpet cleaning, it becomes hard to move it around the carpet since it gets stuck. If it had wheels, it could have been easier to push or pull it. Other than that, the Super Coach Pro is a great backpack that you would wish to have. A significant number of backpack vacuums are solid and robustly built to hold more dirt since they are primarily used for vast cleaning. It can, therefore, save you from frequent emptying the collection bag or disposing of it when full. Thus, the backpack vacuum would be cumbersome to lift it especially if you have upstairs and downstairs to clean. Also, assuming it had wheels, you wouldn’t wheel on the stairs. That is the reason you have to harness it on your back for easy carry as you move around while vacuum cleaning. Again, this kind of vacuum was initially intended for commercial use in hotels, hospitals, schools, and the like. Therefore, the suctions of backpack vacuums are extremely strong and powerful for heavy-duty use. Yes, backpack vacuum cleaners have strong suction, and therefore nothing can be left in its way without being suctioned. However, if you are cleaning much of pets’ hair you will need to unclog your vacuum frequently to increase its effectiveness. A backpack vacuum primarily is designed to clean larger areas in the least time compared to an upright vacuum. If you are looking for a powerful vacuum cleaner, then a backpack vacuum is the best choice. For instance, a backpack vacuum can clean 7,407 sq feet per hour which is about three times more of what an upright vacuum cleaner can do when it covers 2,875 sq feet within the same time. We hope after walking with us through this review you were able to identify your best pick from our top best backpack vacuum cleaners in the market. From reading the review of each product, you were able to get all the information necessary to make an informed choice. You can therefore with confidence click on the unit you have selected to place your order. That way, you will have what you need at the nick of time. Please spare a moment of your time to share your comments below.